People often ask me (they never do, I just wish they would), “But how do I know what you’re doing is magic, Arch Mage?” and I’d reply in my biggest, booming-ist “Merlin” voice, “Because I can make nacho “cheese” out of vegetables!” and then they’d cower in fear and ask for my wisdom while buying all of my scrolls and enchanted kitchen tools. Or something like that. I’ve seen many recipes out there for different vegan cheese-style dips, but the one that I use to silence non-believers is a little different- it’s oil-free and made of potatoes and carrots! I use a microwave steamer to steam the potatoes and carrots, and tend to add seasonings slowly: a little bit of this, a little bit of that…. then ta-dah! Magic. I serve this not only with chips (of course) but also with celery sticks and zucchini slices to increase the veggie content and make a more well-rounded meal out of it! salt as needed- though it does need some! Start with a little, and add to taste! Steam or boil the potatoes and carrots until completely cooked through and tender, then drain. Place ¼ cup nutritional yeast in blender or food processor, followed by the potatoes and carrots. Add salt and pepper and seasonings, to be adjusted once it’s going. Add a little bit of water (start with about a quarter cup, and add slowly!) to get the blender or food processor going, and blend until smooth- add water to reach desired consistency! You may have to stop and scrape down the sides of the blender or food processor, which is normal. Once it’s close to the texture you want, taste it! Nutritional yeast provides the cheesy flavor, so if it needs more, add more 1-2 Tablespoons at a time, with a little more water, as the nutritional yeast is very dry! Combine black beans, corn, and salsa in a microwave-safe bowl and heat for 1-2 minutes, stirring occasionally until heated through and well combined. In a shallow, dip-friendly dish (I use glass pie dish- it always seems to work!) layer the mashed avocado, bean mix, and cheeze sauce. 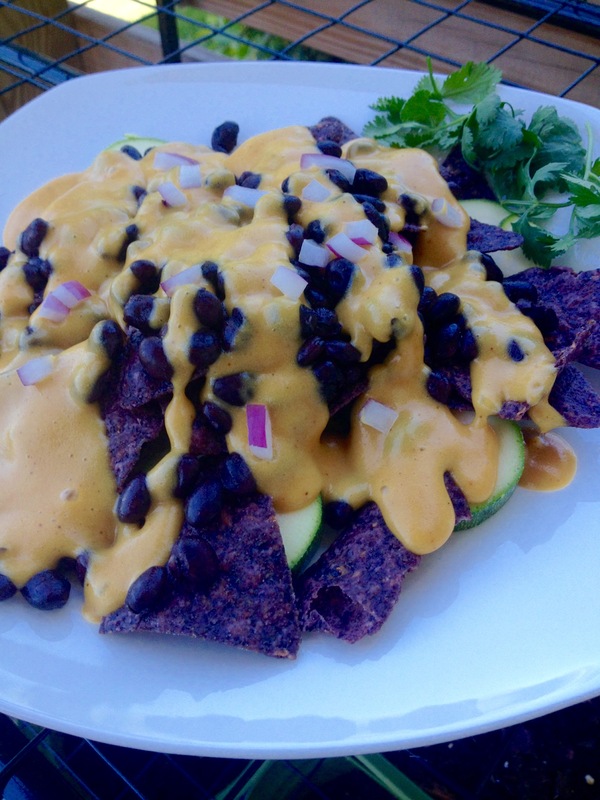 Top with diced tomato, sliced olives and jalapenos, and any other nacho favorites! Serve with chips and/or sliced veggies. This entry was posted in comfort food, Magic Upgrade, powerful & potent and tagged comfort food, DIY, healthy-ish, junk food. Bookmark the permalink.